I'm So, Autumn Calabrese has a new workout series being released this summer called Country Heat. Frankly - I'm cheesy over it. I've had a love-hate relationship with country music, but I never considered working out to country music! That just sounds like fun! And it's Autumn so I know it'll be good! I love lifting, but sometimes you need to change things up. I'm thinking about trying the 22 Minute Hard Corps at some point too. I mean ... it's 22 minutes?!?! And it sounds like it is still very effective despite being short! AND there is a buddy exercise! Tim and I have been working out together so I would LOVE to try that! 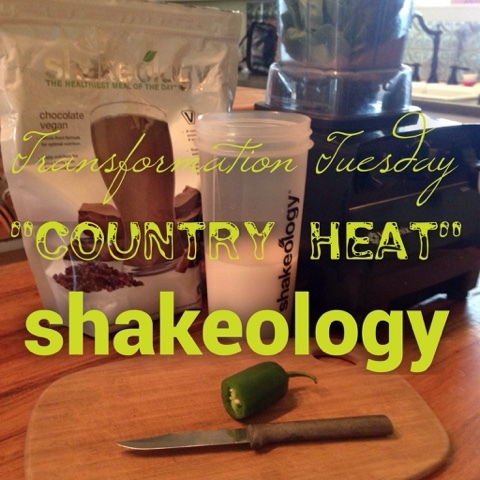 Anyways, I was inspired by Country Heat and Sonic to try a new addition to my Shakeology. I'm LOVING the vegan chocolate by the way! My tummy likes it even better than the regular chocolate, and the flavor is richer and less sweet. If you ever eat (or drink) at Sonic, you've probably seen how they do all these crazy flavors of shakes? We really liked the jalapeño chocolate one (when they made it right ... Some of them tasted like they made the shake, then dumped canned jalapeños in the bottom of the cup). 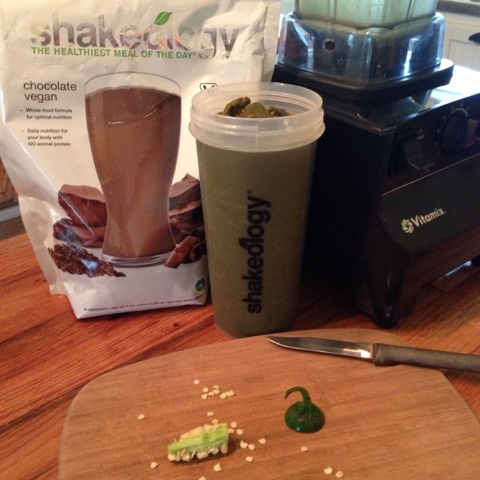 We had a jalapeño sitting on the counter and it hit me ... jalapeño chocolate Shakeology! My first attempt was lackluster. I started a typical breakfast ... lots of fresh baby spinach, a scoop of vegan chocolate Shakeology, and 8 ounces of water. Then I dropped in half a jalapeño (with the seeds and membranes removed). I tasted it, yummy spiciness we may have a winner! Then added my fairly typical half a frozen banana and some ice and blended it till smooth. Apparently banana cancels out jalapeño? I could taste the flavor some but the heat was gone. So the next morning I left out the banana. If you like a little heat with your sweet or are a bit of a daredevil, I highly recommend it! Blend until liquified, then add ice until desired consistency. More ice = less spice though! I really want to hear from you if you try it! Or put your own spin on it!